Since her father left and her mother died, Peyton Cho has dedicated her life to two things: protecting her sister, and learning about alien tech. And the aliens are so much easier to understand, even if she wants to stay as far away from one alien who wouldn’t know the meaning of commitment if it punched him in the face. When a project puts her in the path of Dryce NaFeen, it’s only the fact that the fate of the world is at stake that keeps her from quitting on the spot. Hostile forces have a planet killing weapon, and it will take an alien warrior and a scientist to rescue the planet from certain doom. Boundaries and determination will be tested, and two people from different worlds must learn to work together and trust in a bond that neither of them expected, or everything will be lost. Each Detyen Warriors novel can be read as a standalone. Want to know more about how the Detyen warriors made it to Earth? 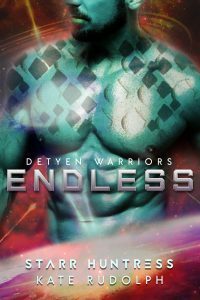 Read the Detyen Warriors series from the beginning to find out. 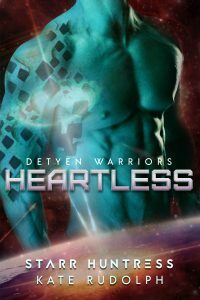 The Detyen Warriors series brings you feisty women, alpha aliens, fated mates, and relationships hot enough to steam up your screen. One click today and start reading now!